Boy this year has flown by. I'm still feeling like its July even though we are actually only 57 days until 2019. Daylight Savings Time has kicked in and the evenings are now dark by 6:00 pm in North Florida. 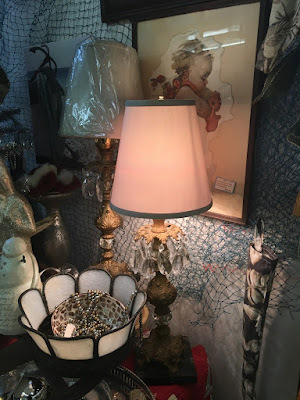 It's been a good summer, busy with my "main job"...lots of fun with my antiquing and my spaces at the Lyon's Head Antique Mall, visits with my sister and working on and around the house. All in all, life has been good to me and for that I am grateful. I know I have been here nearly two years but I am still downsizing as I give up more clothing that is not suited for my new life and that goes for stuff I brought with me for the house. I just don't use it or need it here so I filled the car with donations to several local hospices and the rest went to my local Goodwill. As long as I was at my Goodwill, it couldn't hurt to look around, right? Well, it was a good decision because I found a few great pieces last week and then again this week. 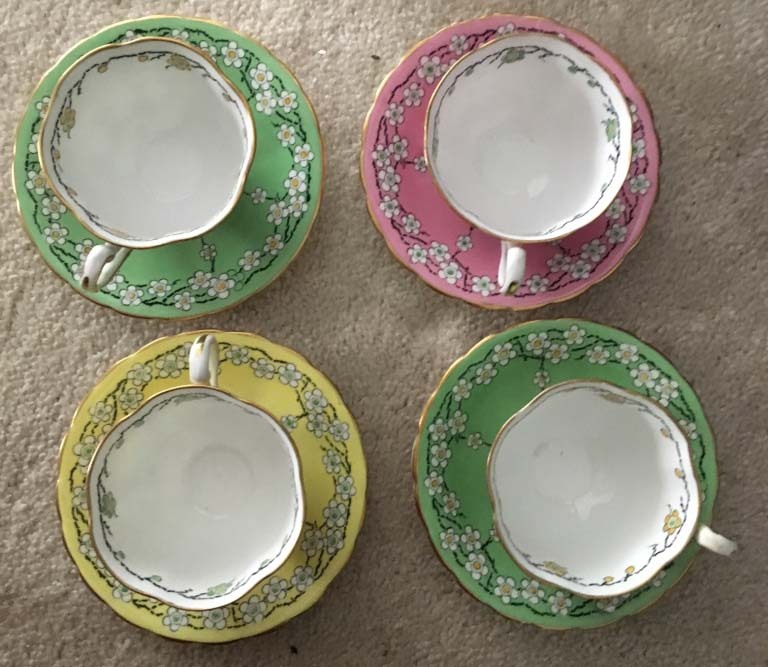 Charming set of four English teacups and saucers in the prettiest of ice cream colors. These just make having tea delightful. 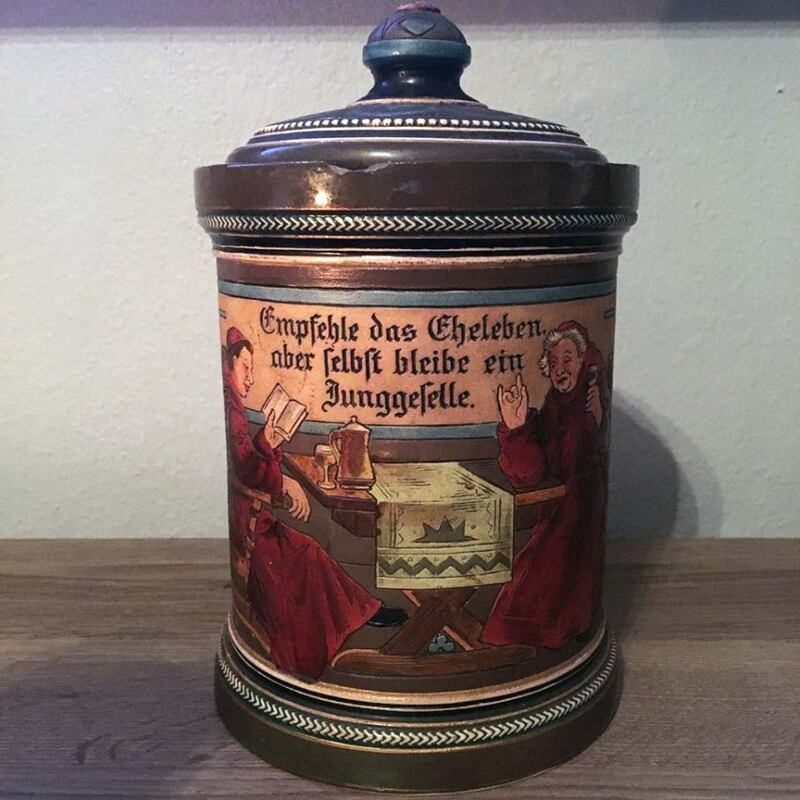 Marvelous antique Germany, Simon Peter Gerz humidor canister. This heavy incised stoneware has a few chips around the lip from use, but Gerz pieces are highly sought after. Circa 1920s. When kitchen stoves needed matches to light the flames, you kept a ceramic match holder nearby. 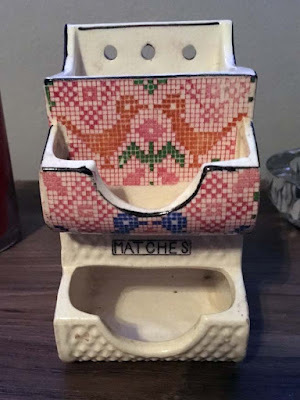 This wallpocket match holder has the pretty sampler cross stitch pattern on it. Made in Japan and circa 1940s. 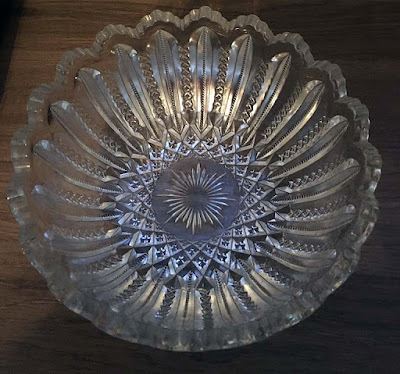 Stunning American Brilliant Cut Glass server. This is now in my personal collection. This charming, mid century ceramic turkey and pewter napkin rings are already in my booth space and ready for the Thanksgiving holiday. More vintage pewter goblets and salt and pepper shakers from the 1970s are now also in my space. 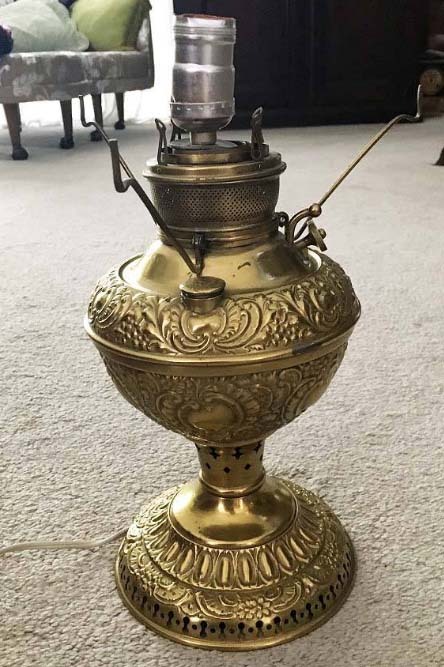 1930s brass bow light may be missing the burner at the top but it holds a votive candler or battery operating one to throw off that light. 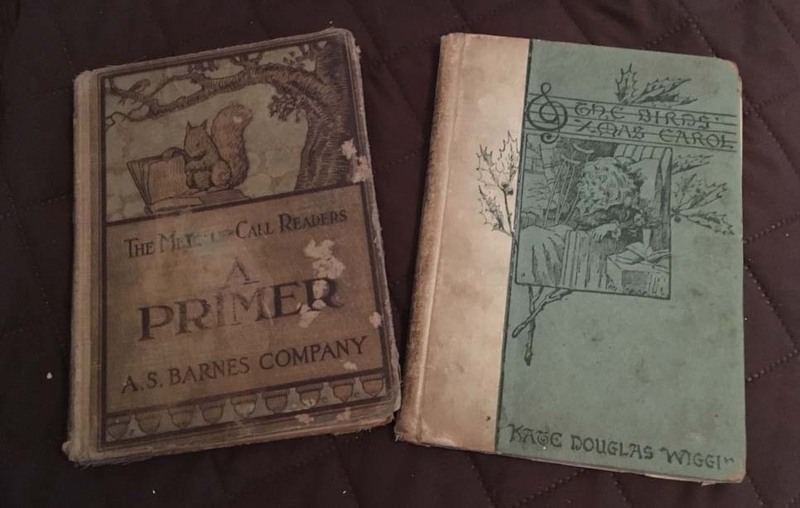 Early primer and a book about Christmas carols. Pretty little ruby flashed EAPG souvenir cup with olive branch of peace. 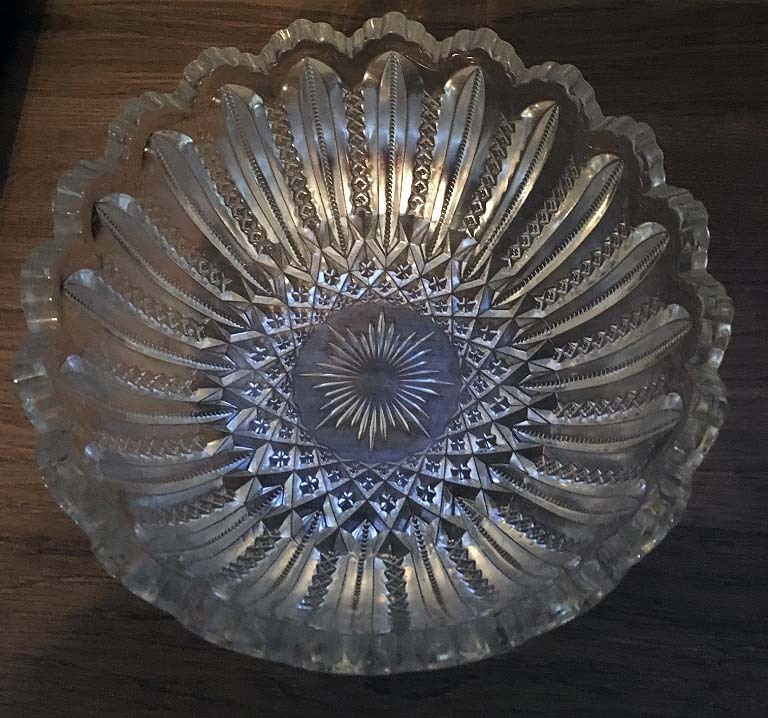 Large Early American Pressed Glass (EAPG) bowl. 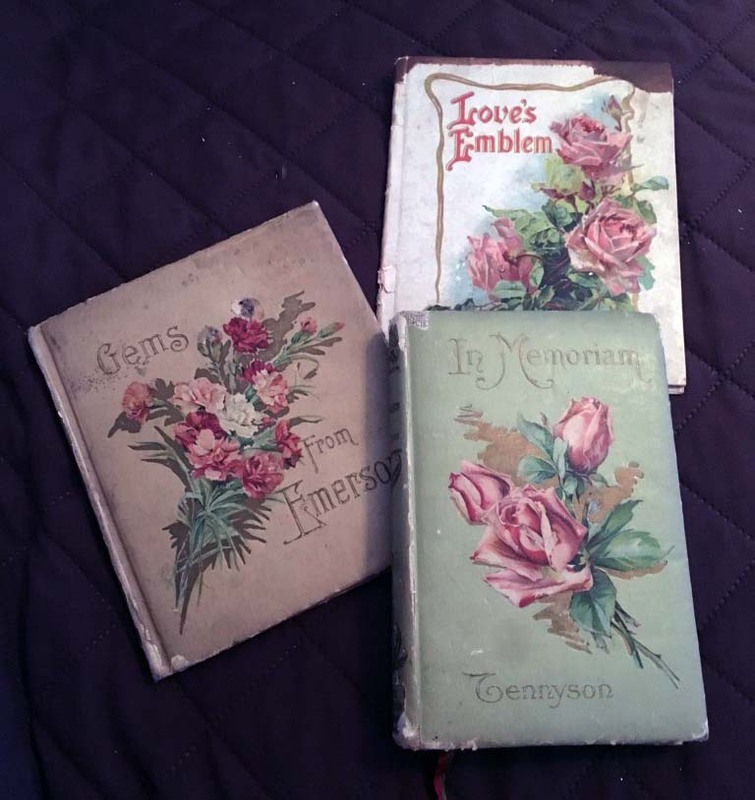 Marvelous condition for something from the late 1890s. Finally, this gorgeous engraved decanter. Doing a lot of research on this piece as it has the look and feel of an 18th century piece, beautifully engraved on two sides, blown bubbles throughout and a pontil on the base. It shows the wear you expect to see on the bottom of a piece with age. Still, this may be a 20th century piece but it is still marvelous. Once I learn more about it I will followup and share the info. Goodwill and an estate sale and then a visit to Cupcake Heaven made it a marvelous Saturday for finding treasure. One of those days when really good finds just appeared. 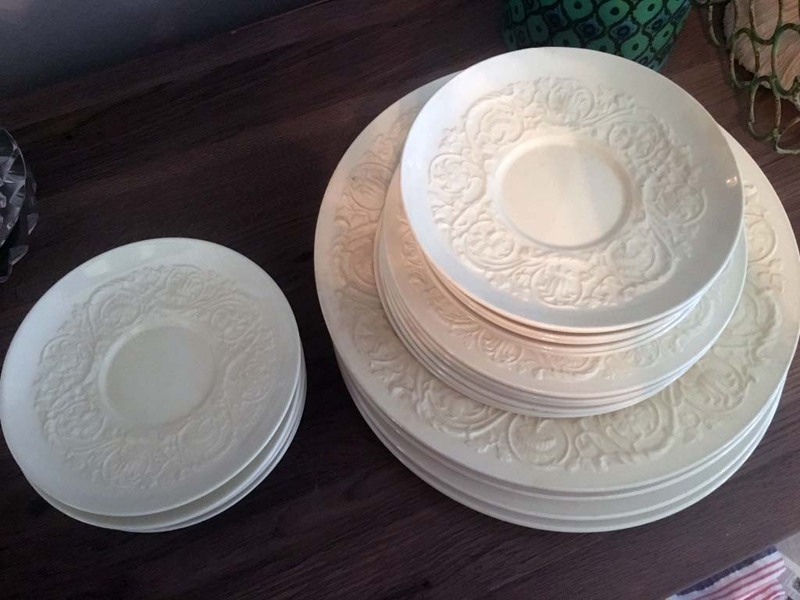 Right out the gate, I came across this marvelous set of vintage Wedgwood dinner and dessert plates and saucers. 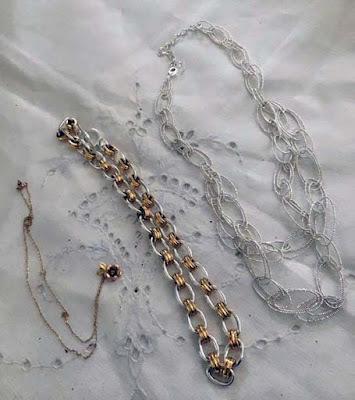 The pattern is Patrician and one of the most popular of the elegant pieces they offer. 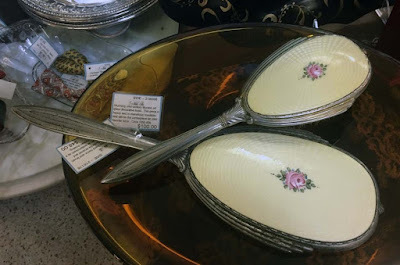 Lovely Art Deco hand mirror and brush “buttercream” Guilloche enamel and silverplate. Known as buttercream as it is the color of buttercream frosting. Circa 1930s. This is a pretty little set. Beautiful cut glass cordial glasses. 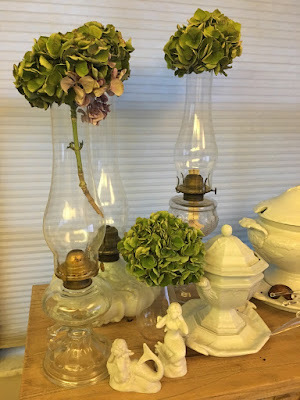 These have that marvelous sound of a bell when flicked by a finger and have a heavy cut base. Having to do a little homework on these as they have the look of feel of 19th century glass. Will follow up with what I learn. 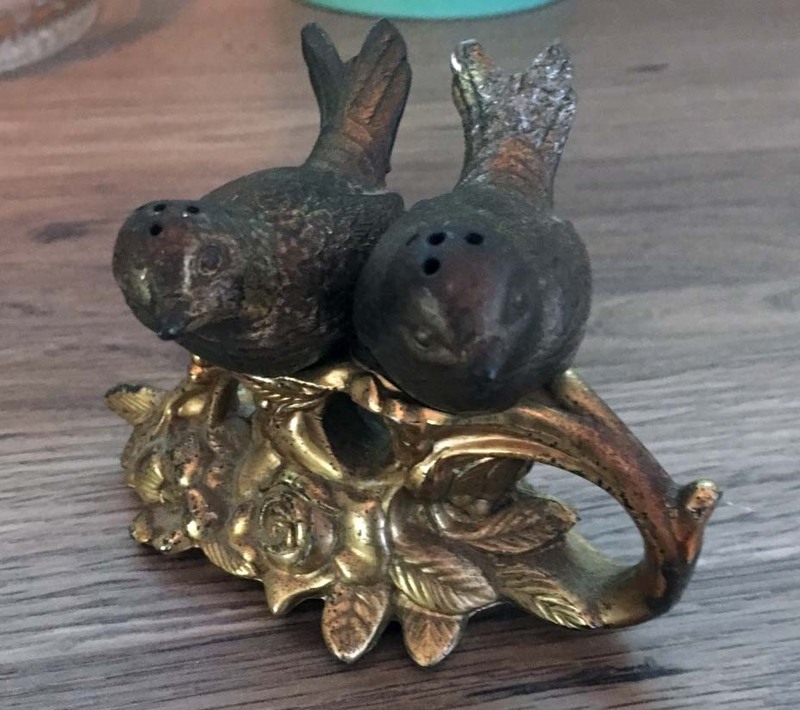 Charming, Italian, hand carved animated wine stopper. 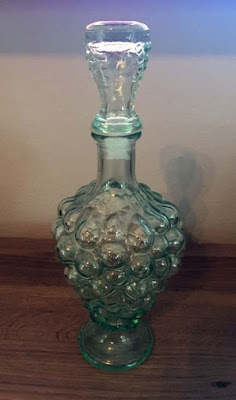 What fun to pop this little guy in when serving wine. 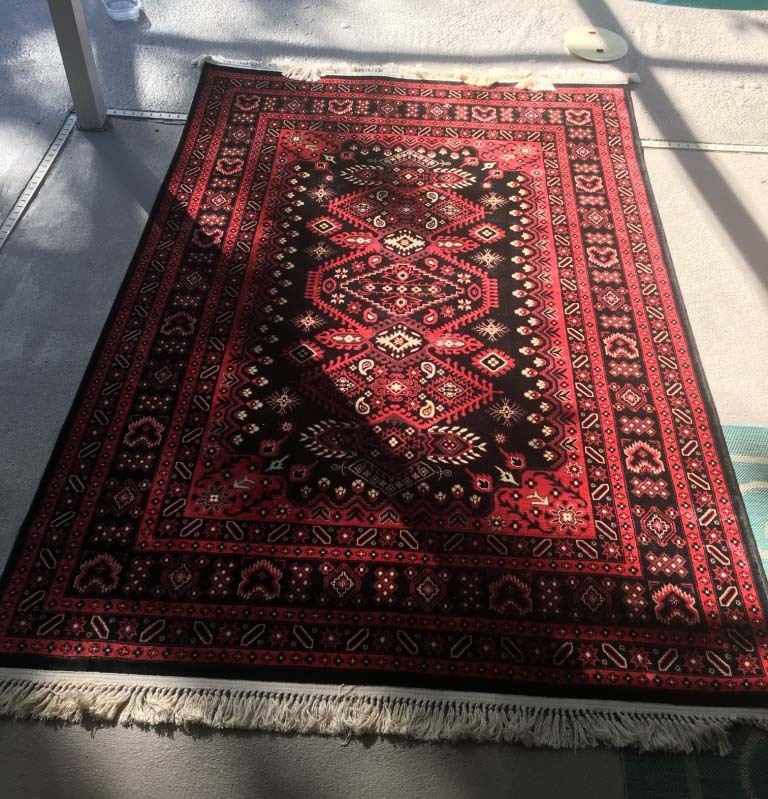 From a Weeki Wachee estate, this stunning Persian Rug looks like it has never been walked on. Gorgeous, Persian rug by Crown Collection Dynamic Rugs. 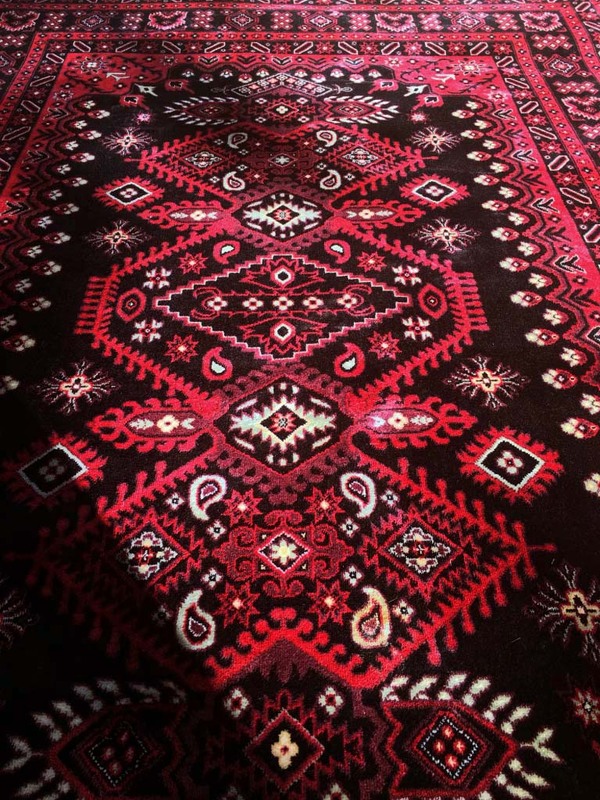 The elegance of the Crown collection is unmatched, reminiscent of classic Persian designs, placed against the strong red viscose background creates a royal ambiance for the aptly named Crown collection. 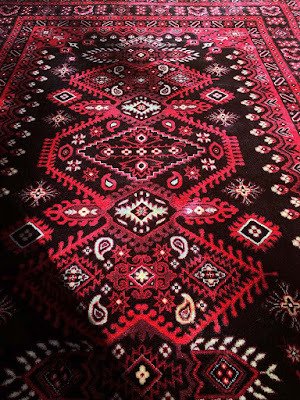 Rug is 100% viscose, machine-made in Turkey and measures 5 feet 3 inches by 7 feet 7 inches. Brilliant reds on a field of black with white details. Charming little Italian inlay music box is a small size and perfect for a young girl to keep her favorite pieces of jewelry. And now, the piece de resistance, I came across these taped together at Goodwill. A stunning pair of English Victorian, silverplate epergne candlesticks. In amazing condition, I knew these were special but did notknow they were Victorian age. I nearly did a cartwheel to where this was "thrown" in the corner of the shelf. The matching centerpiece, a seven tier epergene vases. 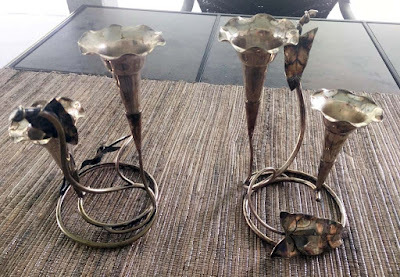 All, like the candlesticks can be removed from the bases for cleaning. This is also in amazing condition and marked. A quick google when I got home and I learned that I really found a treasure. Now the struggle, do I keep or do I sell? We shall see. Summer is coming to an end and the days will begin to get shorter. 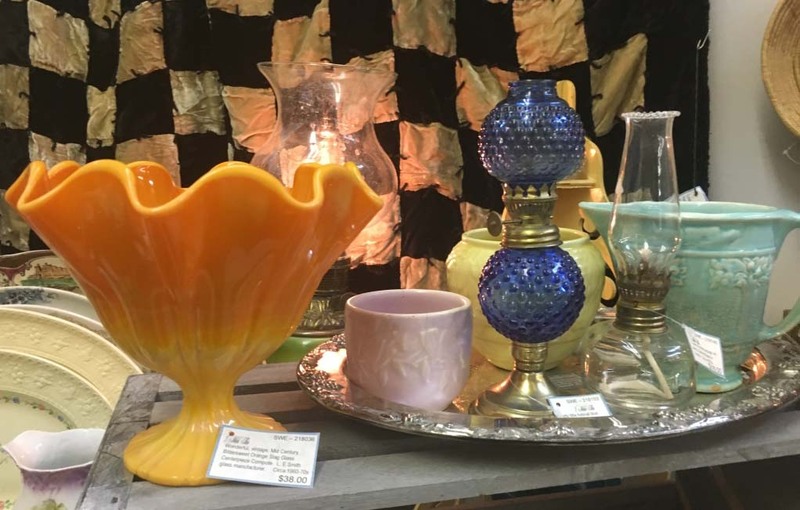 I have begun to bring fall into my spaces at the Lyon's Head Antique Mall. 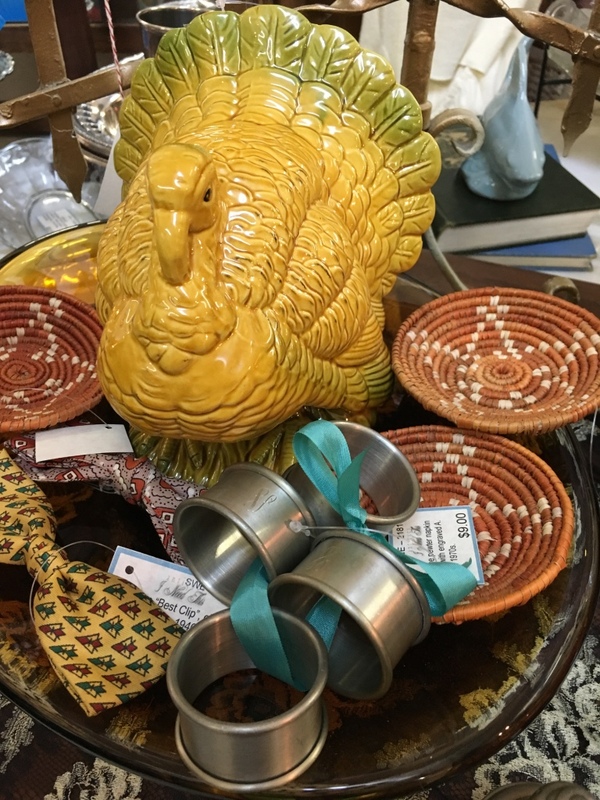 Handsome pair of turkey platters, everyone needs one for the holidays. Mid century glass is hot, hot, hot and this pretty orange gradient, ruffled footed bowl would look marvelous when filled with your best dinner rolls or crescents for your holiday dinner. 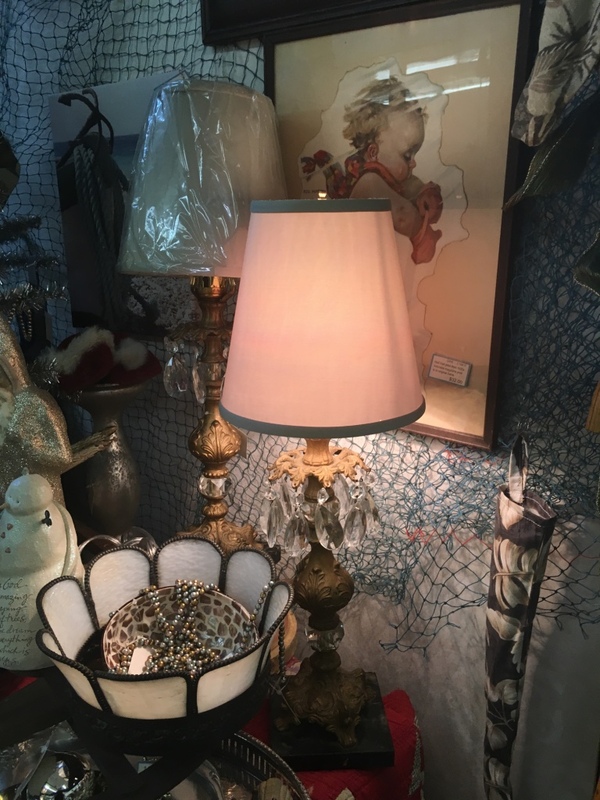 Rewired this pair of Hollywood Regency lamps and added a pair of new, silk shades. Heavy with black marble bases, cast spelter with original gold paint and with crystal prisms. Circa 1930s. 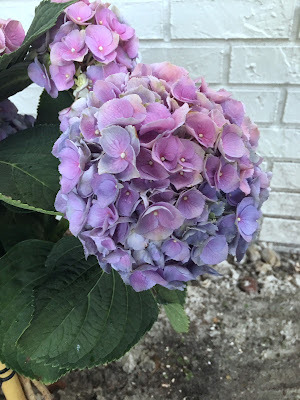 Finally, when August rolls around it is time to begin drying the hydrangea mops. I have trays drying them all over the house and these are sacked in glass chimneys as I ran out of trays. They are drying a gorgeous shade of green and will be ready for decorative fills in quad plate and vintage glassware. It's July? Anyone else still feel like it's March? I don't know where the first half of 2018 has gone to but then my last post was in April so time is moving faster than I can keep up with these days. I'm slammed at my "day" job and it's not gonna let up and I'm doing a lot of yard work around my home but it takes time with these hot and humid days. I'm only good for about 40 minutes when I just have to stop digging in the dirt because of the heat. Still, I love the way my landscaping is beginning to come together and hopefully it will all be completed in another few months. 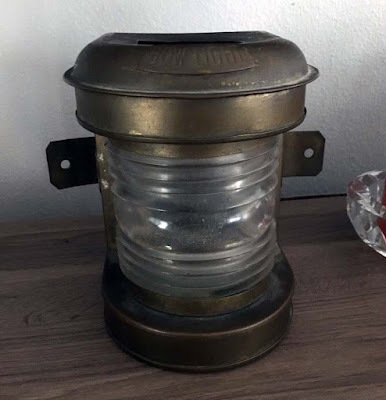 Saturdays are my treasure hunt day and I have been finding some really nifty pieces these last few weeks. 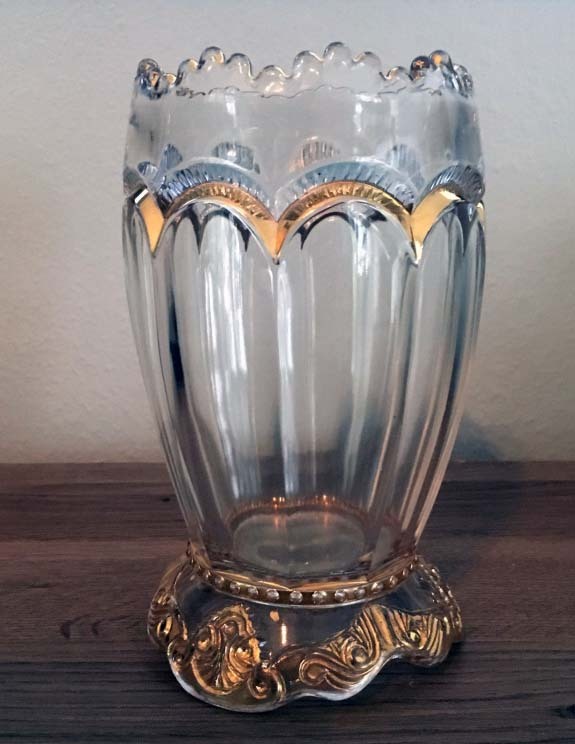 A stunning, Early American Pressed Glass (EAPG) pedestal celery called Adams but more popularly known as Square Panes, 1880s. Oh, my knees are weak, found a marvelous antique brass oil lamp from France. Two for two? 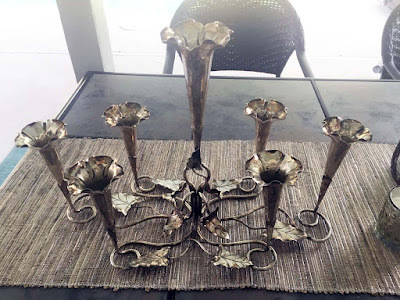 This beauty has been electrified but I don't mind, I adore the decorative brass and will use this in my home. 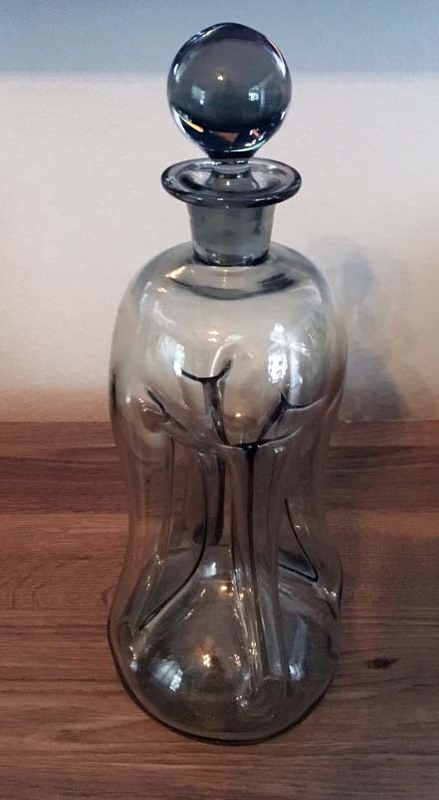 Mid Century Holmegaard smoke glass decanter designed by Jacob Bang of Denmark. 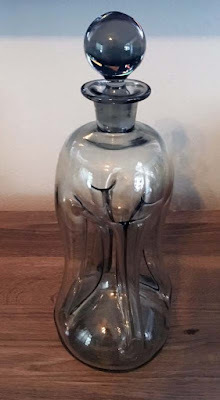 Known as a Kluk Kluk (pinched) glass decanter. 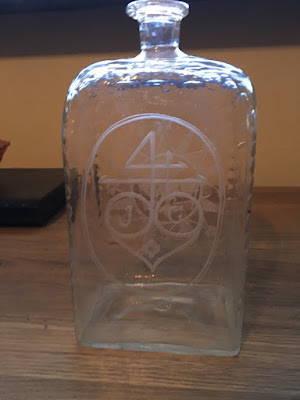 Originally held Holmegaard Danish brandy, these decanters are in demand with the Ikea generation. Vintage, seagreen, blow out glass grape cluster decanter. 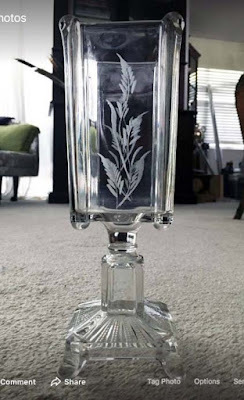 These are so much fun to decorate with or fill with your favorite wine. 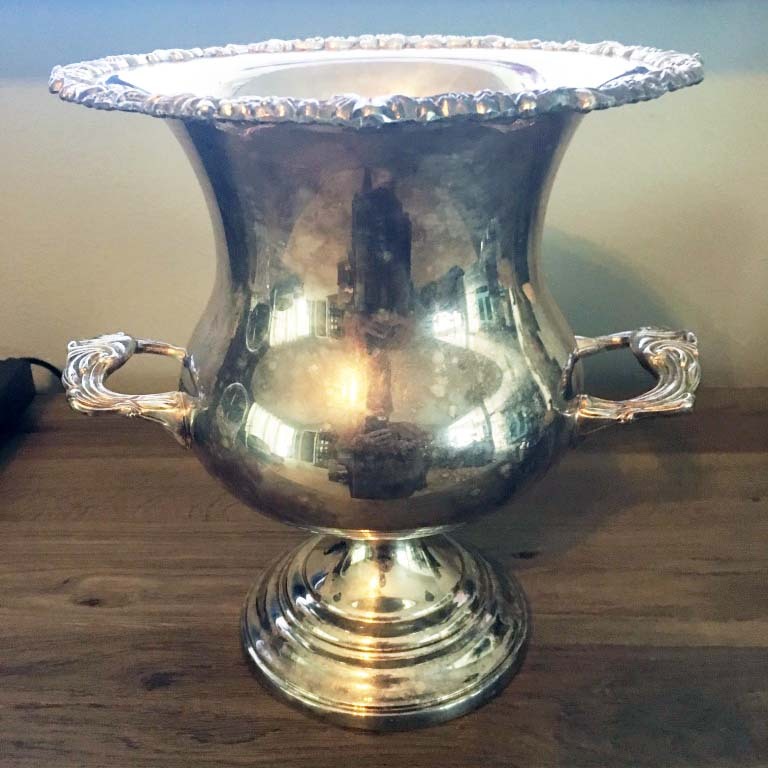 Love these mid century silverplated champagne buckets. This was is by Sheridan and in marvelous condition. I love to use these as Christmas tree stands. Stunning EAPG gold and ruby flash large, oval bowl. 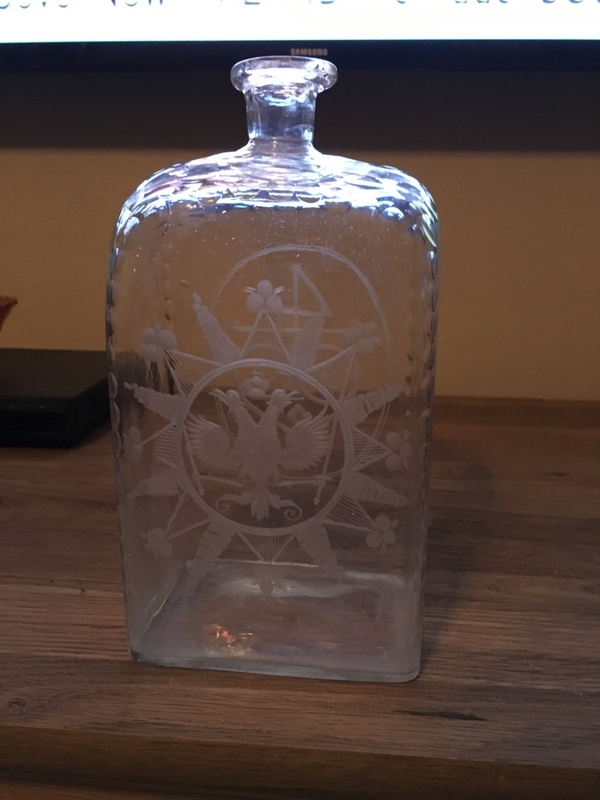 US Glass, this is called Delaware and was produced in 1899. 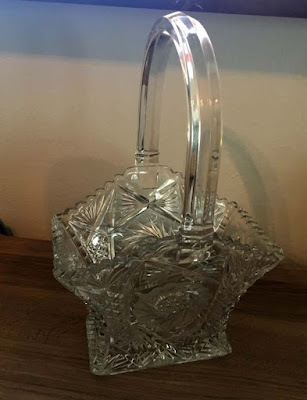 Lovely 1890s, Riverside Glass Co., EAPG spooner. 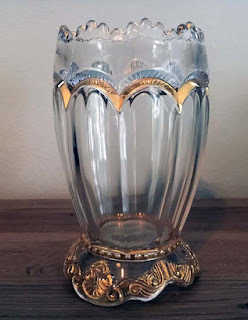 Pattern: Empress, clear with gold lustre trim. 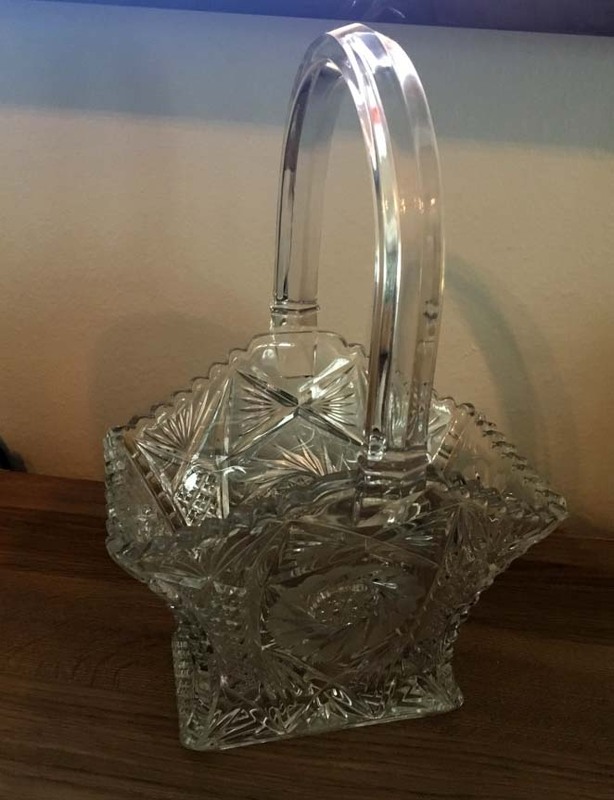 Heisey Glass Pinwheel and Fan basket. This bad boy is big and in perfect condition. Be still my heart, my favorite colors are calling me. 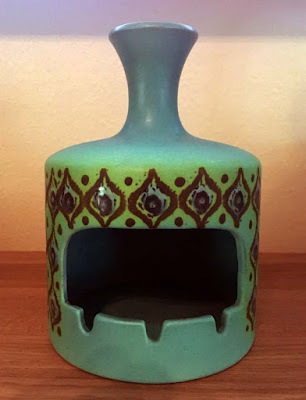 This delightful 1960s pottery ashtray is too cha cha for words. I've never been a smoker and have no use for ash trays but the colors are as seawitchy as you can get so I had to bring it home and use it to store my remotes. Can these little birds me anymore charming? 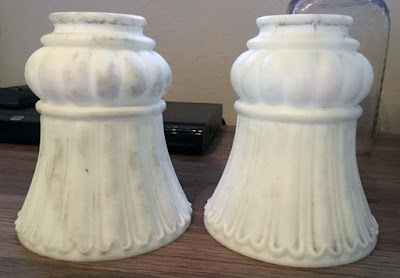 I will fill them with lavender talc and place in the guest bedroom for guests to sprinkle on their sheets. 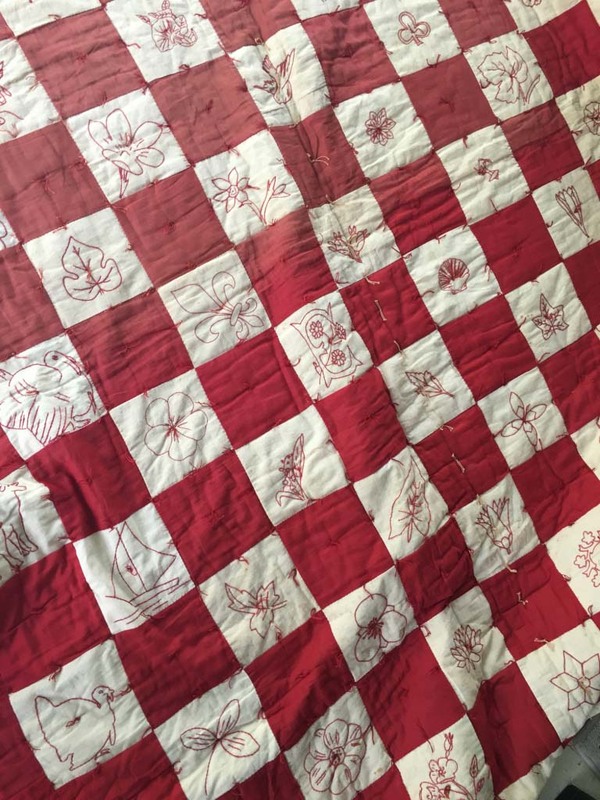 And finally, a beautiful red and white embroidered on feed sack cloth quilt. This 1930s beauty is all hand pieced and embroidered. She has a faded section but I love it anyway. It's always fascinating to see what shows up in my area. I can honestly say Florida is a grab bag of finds like no other state I have ever lived in. This, of course, makes the hunt always interesting. A lovely and busy weekend filled with planting hibiscus and hydrangeas and preparing beds for landscaping. I lost every shrub and plant from the winter double frost we had and had to pull up everything and start anew. Still, this was an opportunity to replace what was originally planted, which were non indigenous flora, with native tropical plants like hibiscus. The only non native item I added were hydrangeas. I adore these mopheads and had to plant them under the front window. Replaced the heavy, white plastic blinds with cellular shades. Love these for their black out capabilities and they are light in weight and easy in lifting and closing. In between my household tasks I did a little junkin in my local haunts. 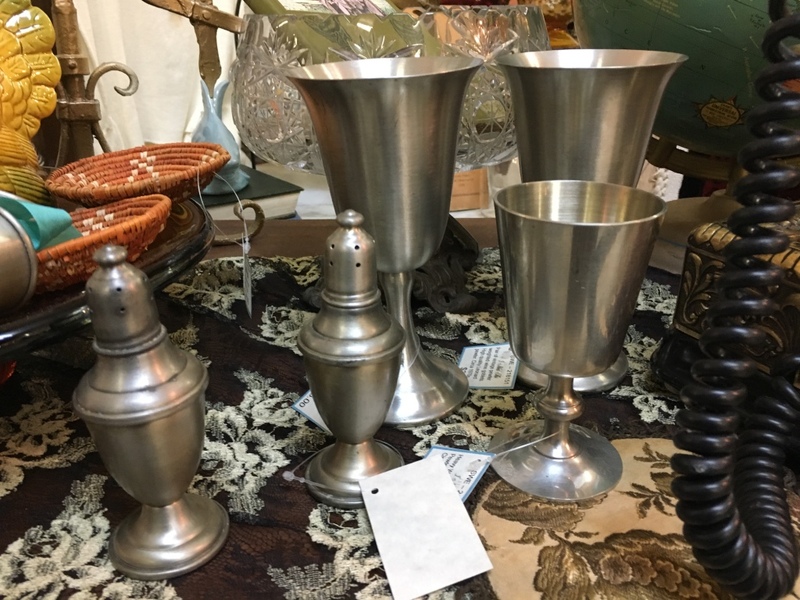 A fantastic, retro nine piece set of vintage mid-century silver rimmed glass tumblers with glass coasters in caddy. 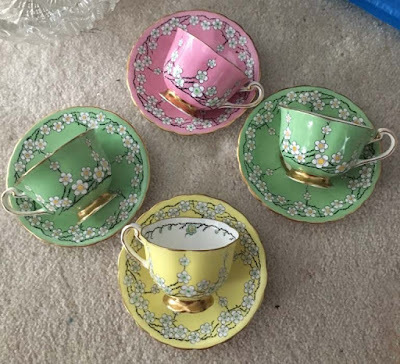 Queens Lustreware Set by Kimiko. 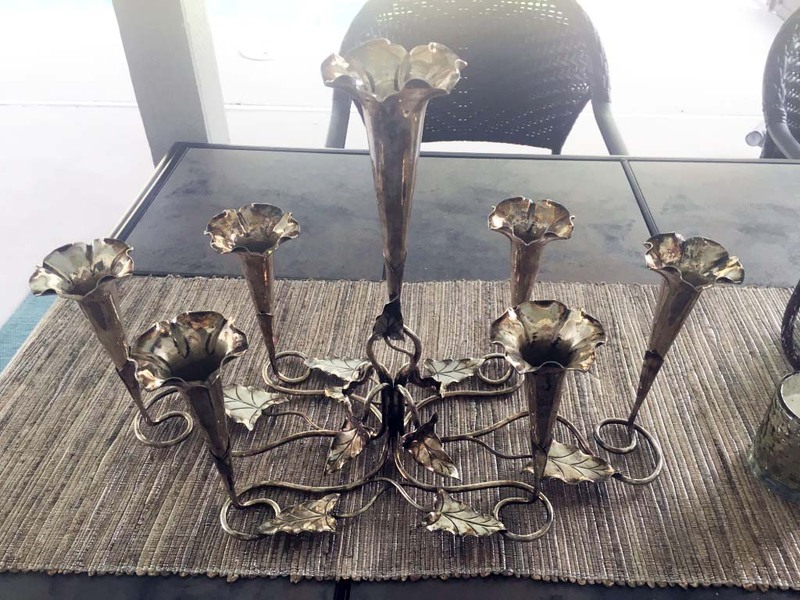 The set was a hostess gift for early Guardianware home parties. Circa 1970s Looks like it was never used. 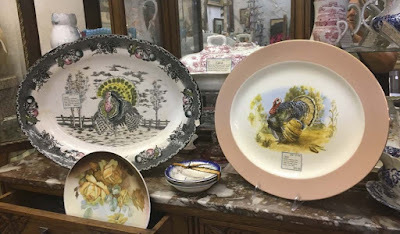 Fell in love with these vintage Taylor Smith Taylor, Bread and Butter plates and berry bowls. Pattern is called Conversation and they are a marvelous green border edge with a Jack in the Pulpit in the center. Circa early 1950's. You don't see this pattern too often. 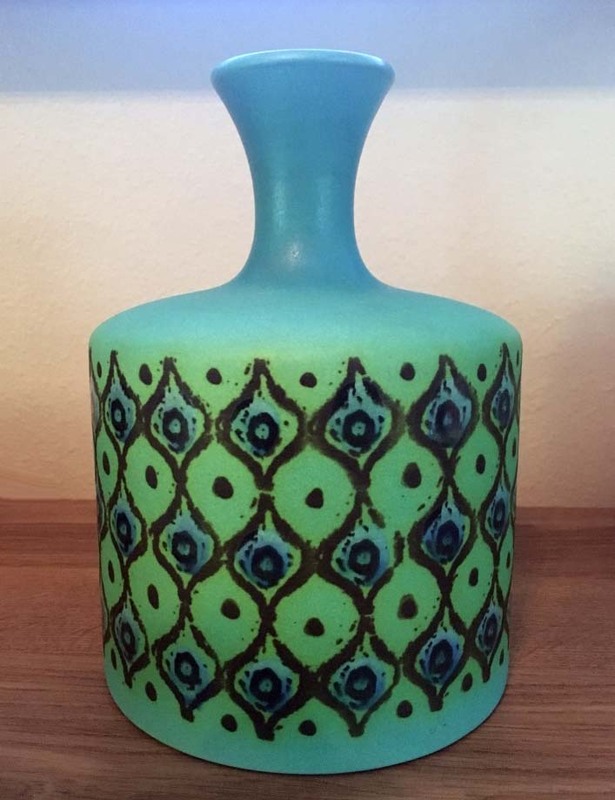 Mid century stretch and swung glass vases are hot hot hot. I can't keep them in my booth spaces long and the warm colors like this amber footed bud vase sell quickly. 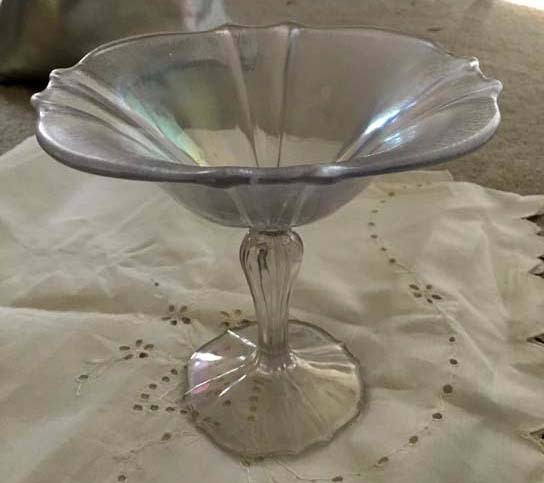 Always crazy for anything Early American Pressed Glass (EAPG) and this pretty footed server with handle. 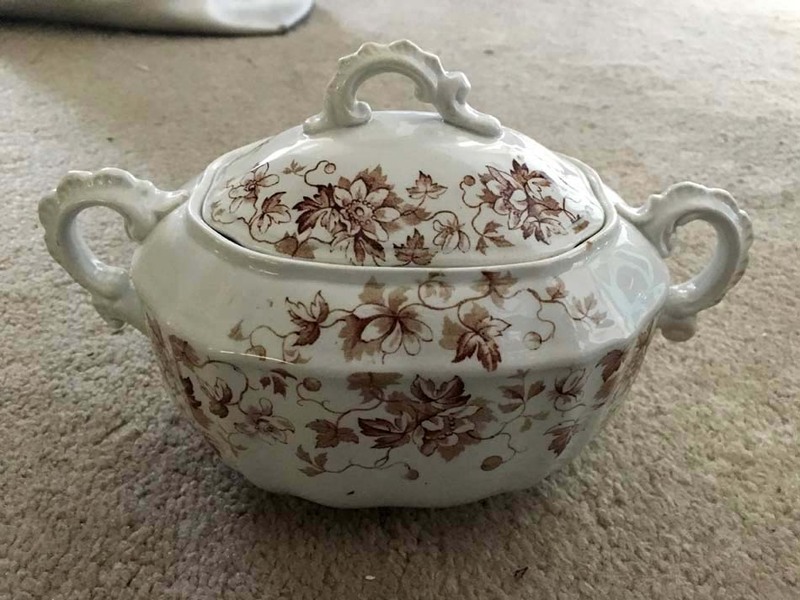 It's hard to see but there is lovely floral etchings on it. This will be added to my personal collection. EAPG is often priced for pennies on their value and this one was marked at $1.99. Lucky me. I have never come across a hat stand with a vintage dollhead with bobbed hair. Nice art deco stand. 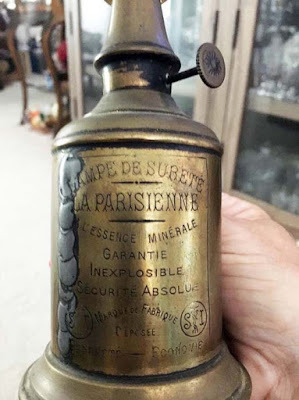 How fun is this Cologne bottle embossed with western motifs and the word Stampede? This amber bottle is a cologne called Stampede for Sears and Roebuck. Next to it is a small Wheaton bottle of a fish that says Doctor Fisch's Bitters, Millerville, New Jersey. Both are from the 1970s. 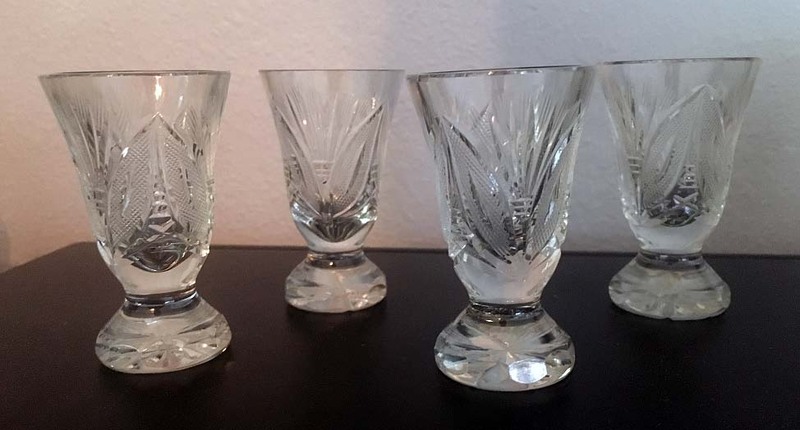 Lovely pair of cut crystal sherbet goblets. These are gorgeous. 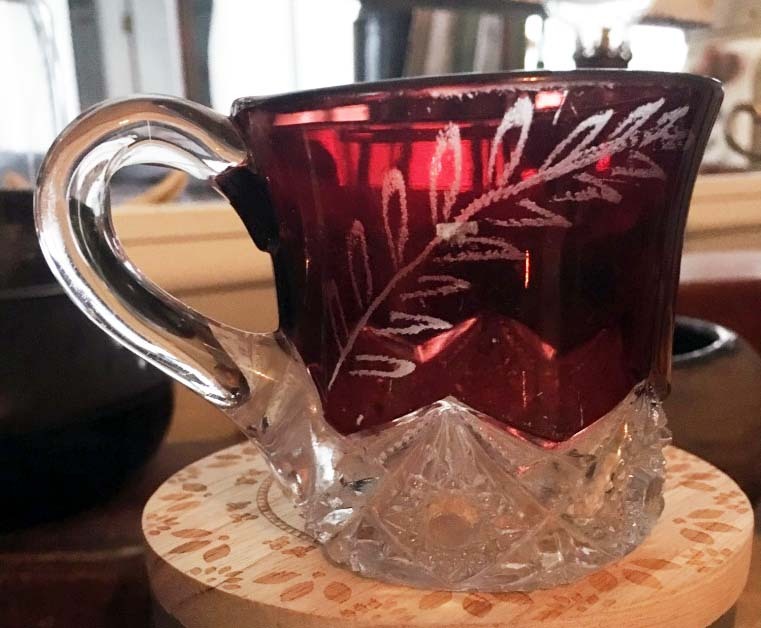 And my last find is this Charming child's cup with the word sweetheart. CHERRY W/ THUMBPRINT aka Paneled Cherry ca. 1904. Another EAPG piece that I may hold for a while before I bring it into my space. It's done. I finally finished my new sewing storage station. As much as I adore my little Florida home, it is lacking in storage space and I needed a place to store my sewing machine, fabric, notations, iron, patterns and trims. The piece also needed to have easy access as I use my sewing machine a lot. I've been wanting to do a decoupage/chalk paint piece for a while now and I love the way this turned out. The two bottom drawers hold lots of fabric and the top portion my machine, iron, patterns, threads and other sewing accessories and supplies. I purchased the media armoire from a local consignment shop. 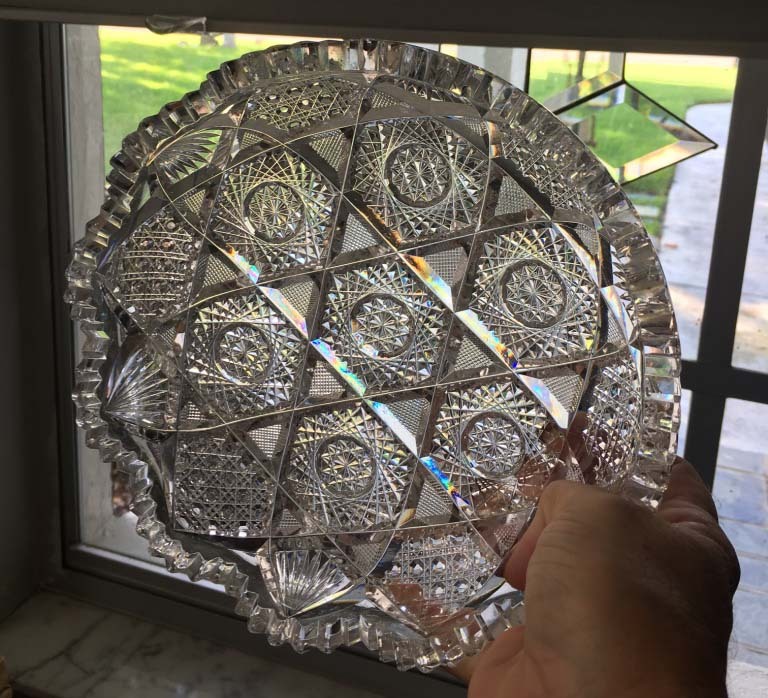 You can pick them up cheap these days and I wanted a piece that had smooth, clean lines. Well made and heavy, it is a massive piece and thankfully, it separated into two pieces. I gave it a few coats of pale, coastal blue paint. 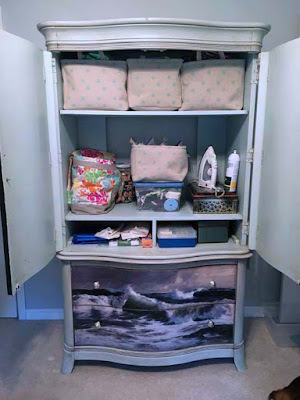 I then decoupaged a poster over the two drawers. This fit beautifully as I did not have to to trim it down at all, just center it over the split between the two drawers. 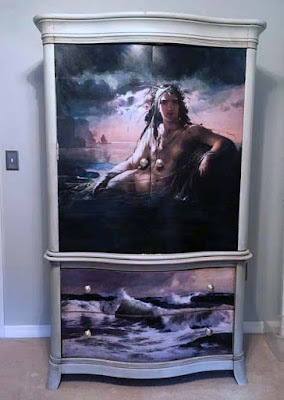 Decoupaged the mermaid poster to the large doors and then went back and painted the top sky and the bottom ocean to match the poster. A nice Kona stain and wax finish and new knobs and I am head over teakettle crazy for my new storage piece. I'm always fascinated the way a little paint and stained wax finish can so change a piece. In between finishing up my sewing armoire, I visited a few haunts for treasure. 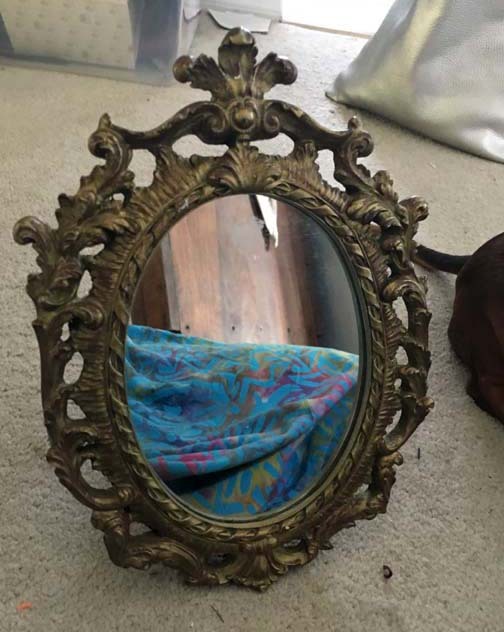 Pretty vintage frame with a mirror in it. 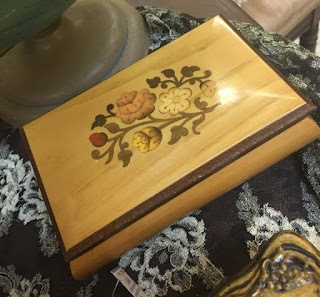 Not a large piece but perfect from a dresser or table. Lovely little transferware sugar bowl. This was a goodwill find. 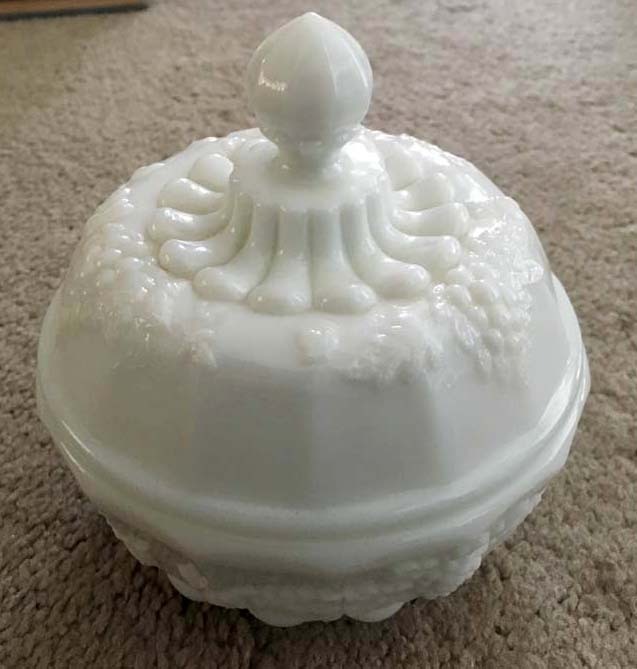 Everyone loves popular paneled grape milkglass and this lidded candy or powder dish is a charmer. Lovely stretch glass footed compote has the palest shade of iridescence. Do I keep or do I sell? The struggle is real. 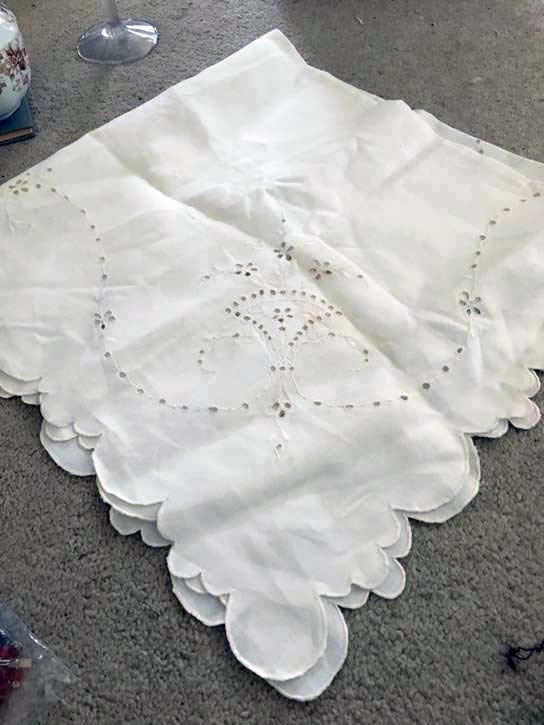 Always delighted to find Victorian whites and this parlor cloth is in excellent condition. 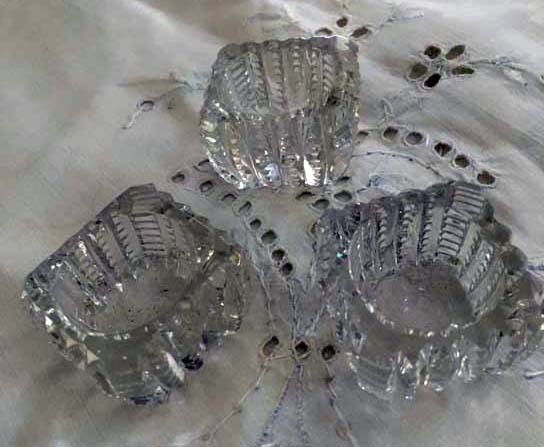 Three, late Victorian, cut glass salt cellars are a Goodwill find. 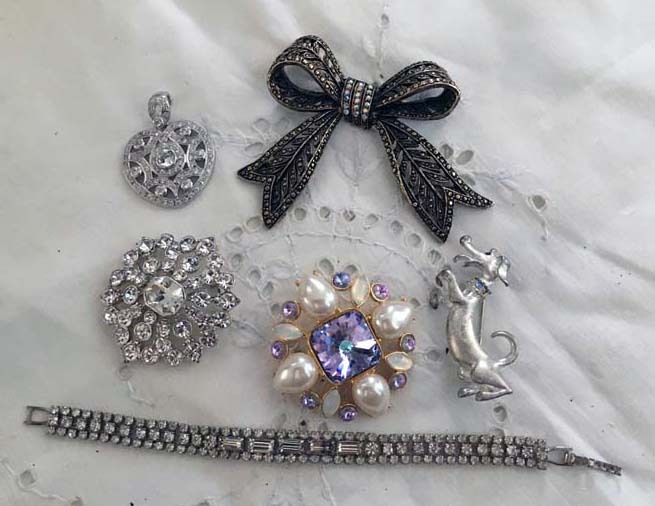 A lovely selection of mid century pins and a bracelet. All of the rhinestones are clear and full of color and sparkle. 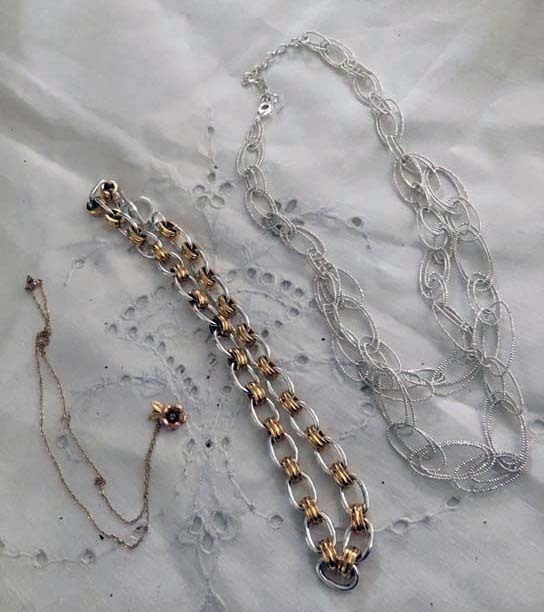 Three necklace, the famous Krementz rose, a Brooks Brothers chain link choker and a light chain link in silver. 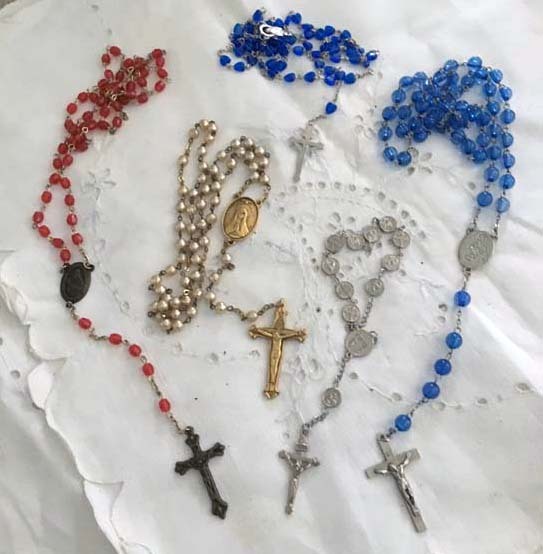 And finally, a nice selection of mid century rosaries. These always sell well for me. The snowbird season is nearly over and most have begun their trek up north. Hard to believe that school is nearly out for kids and the summer season will be upon us shortly. Sis is coming up to see me in May. We always have a great time and laugh so hard it hurts.